Cruises are an amazing way to visit different countries and explore new cultures, discovering amazing attractions, braving new adventures, relishing exquisite tastes, and more along the way. But what happens on your cruise when a port of call is canceled and your itinerary changes? Fortunately, losing a port of call does not mean losing all the fun and opportunities of your cruise. There are many different reasons why a cruise ship’s itinerary may be altered and a port of call could be canceled. Poor weather at the port could prevent the ship from docking safely, or a natural disaster such as a hurricane, mudslide, or wildfire could have damaged the port area extensively and it is not yet safe for visitors. Bad weather along the ship’s route could also slow the ship sufficiently so it cannot arrive at the port on time. Weather is not the only factor that may cancel a port of call, however. Construction accidents, fires, or other incidents at the pier could damage equipment so the ship cannot approach or dock safely. Local crime rates or civil unrest could be on the rise, making the destination less safe for visiting tourists. Issues on board the ship could also impact whether a port may need to be canceled. If a ship is having engine difficulty, it may not be able to make it to the port of call on time, or might be so significantly delayed that a visit is no longer worthwhile. Illness outbreaks on board could also cause a pot of call to be canceled if the local authorities decide to quarantine the ship and not permit passengers to debark. Some port of call cancelations can also be financially motivated. If a port of call has recently increased taxes and fees on cruise ships, the cruise line may opt to forgo the port instead of passing those fees along to passengers, especially if the increase is too expensive and will impact overall cruise fares. Regardless of the underlying reasons, it is always a difficult decision to cancel a port of call. Cruise lines and ships try not to change itineraries and do not want to disappoint or inconvenience passengers. 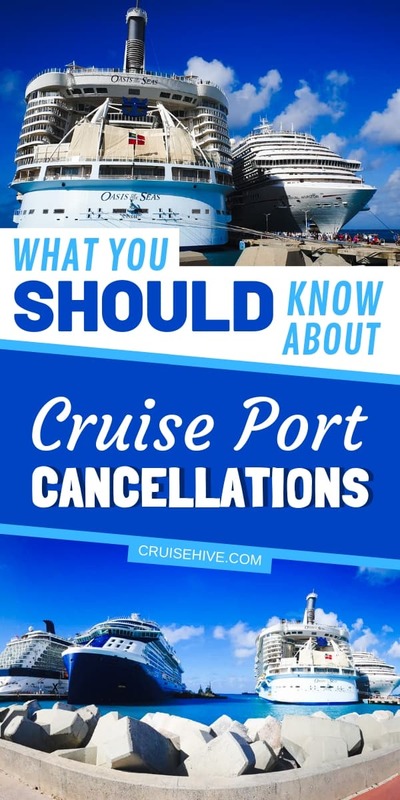 If a port of call cancelation is necessary, the itinerary change will be made as soon as possible so passengers can be notified and may have the option to change their plans if needed. Many times, however, a port of call will not be canceled until the ship is en route to its destination, and passengers may not know about the change until just a few hours before they had expected to arrive. It is important to remember that no itinerary is guaranteed and ports of call may be altered at any time and for any reason deemed necessary by the ship’s captain and officers, as well as at the discretion of the cruise line. The safety of the ship’s passengers is always the foremost concern when deciding to cancel any port of call, and if the situation is unsafe, the cancelation will be made to keep passengers from excessive risk. Your Port of Call is Canceled – Now What? As soon as a port of call must be canceled, passengers will be notified and given as much explanation as is possible and prudent so they can understand the decision. If the cancelation occurs long before embarkation, such as in the case of a change in port fees or country policies that require extensive itinerary changes, passengers may have the opportunity to rebook their cruise or change their entire vacation. In this case, the cruise line may waive timing requirements for full refunds if passengers decide the new cruise itinerary is not suitable for their vacation plans. If a port of call is canceled once a cruise is underway, passengers will be notified with letters delivered to their cabins and announcements made over the ship’s loudspeakers. All port fees associated with that particular port of call will be refunded, and any shore tours booked through the cruise line for that port will also be automatically refunded. Passengers who booked tours with independent companies, however, will need to contact those companies right away to discuss their options, and refunds may not be guaranteed on such short notice. Additional compensation such as onboard credit, drink coupons, partial cruise fare refunds, or other discounts are not guaranteed and should not be expected. In extreme cases that may involve multiple port cancelations or a shortened cruise, the cruise line may choose to offer additional compensation, but such situations will vary. Once passengers know they will be staying on board their ship, what will be available to do since there are no shore tours to take advantage of? Fortunately, the cruise ship will offer a wide range of fun options for passengers to enjoy. If possible, the next port of call may be extended, and the ship may work to arrive at the next destination earlier to allow passengers more time to experience the location. Extra shore tours could be offered at the next port of call, and with the extended visit, passengers may be able to enjoy more than one tour. In some cases, an alternative port of call may be added to the itinerary. While it may not be the initial destination that was expected, passengers will still be able to enjoy the fun and excitement of a port of call, including shore tours, shopping options, beach relaxation, exotic dining, and more. If there is no replacement port of call and no option for an extended call at the next destination, passengers will be on board their ship instead of in port once a cancelation is made. That doesn’t mean there will be nothing to do, however, as the ship’s cruise director and entertainment staff will take extra steps to offer even more activities, games, and fun on board. Dance classes, trivia contests, craft projects, deck games, live music, poolside movies, and other activities will quickly be added to the daily schedule and updated schedules will be posted throughout the ship and updated on shipboard apps. Even without extra activities on the schedule, guests can still take advantage of all their ship has to offer even if they aren’t in port. The ship’s pools, casino, waterslides, miniature golf course, rock wall, surfing simulator, basketball court, arcade, whirlpools, and other features should be open, and there may be additional spa specials or shopping opportunities offered. Even though passengers may lose a port of call during their cruise because of an unexpected cancelation, they will not lose the fun and relaxation of their cruise thanks to the dedication of the crew and all the options that are available on board. A canceled port may be a disappointment, but the cruise can still be a fun and memorable vacation. Make sure you know what needs to be done with these 12 tips for first-time cruisers. Prepare the right way and for during the voyage.